The club wishes to congratulate John Ludwig on winning clear 1st place in our 2018 Club Championship this past weekend. The win gives him his 5th CFCC Club Champion title, an accomplishment only two other club members have experienced in their lifetime of competing in the storied history of our annual Club Championship! 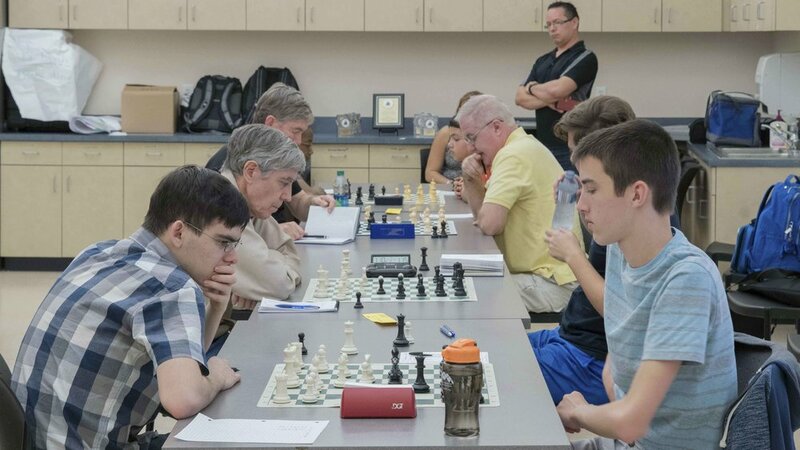 Round 4, Board One, John Ludwig (2463) (L) versus Theo Slade (2177) (R) during the CFCC Club Championship hosted by the UCF Chess Club. His five CFCC Club Champion titles now places him only one title short of the club’s all time leading title holder Wilmer Chavira who has six titles, and matching the title count of five-time Club Champion and CFCC President Larry Storch. With a lower than usual turnout of twelve players at this year’s CFCC Club Championship, only 2nd place winner Theo Slade was able to sufficiently challenge John to a draw in their 4th round matchup on board one (pictured above), keeping John from sweeping the tournament with a final score of 4.5/5. We look forward to seeing what happens at next year’s Club Championship event! The club wishes to congratulate the other winners who placed in the weekend tournament event! Daniel Smith (1639 (L) Top U1800, Theo Slade (2177) (M) 2nd Place and William Fink (1871) (R) Top U2000. 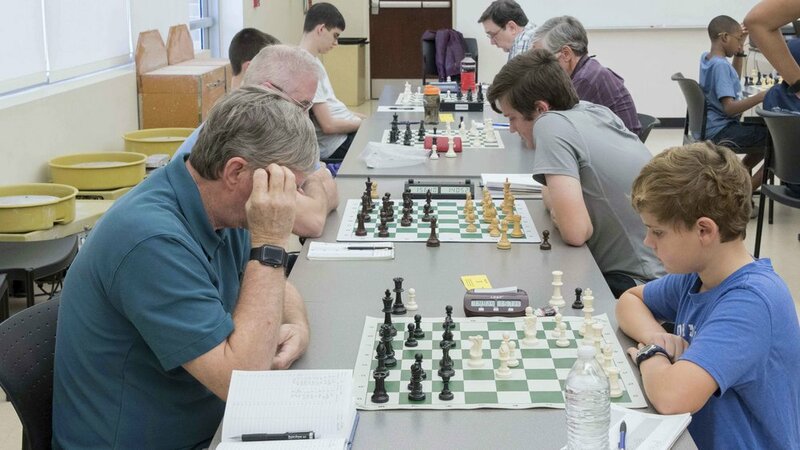 The Central Florida Chess Club (CFCC) Championships were held at the University of Central Florida (UCF) on February 10-11, 2018. The UCF is a great venue since there is plenty of room, it is mostly quiet, and there are plenty of places to eat nearby. Unlike most tournaments in Florida, there were no separate schedules or sections. There were only twelve players in total, however, so obviously having only one section was a necessity. Personally, I prefer having one schedule because I think it is fairer, but this tournament was similar to a two-day schedule, except the first game was played with the same time control as the rest of the rounds, which was G/120; d5. Given that we played three games on Saturday, that meant potentially over twelve hours of chess in one day, but luckily a lot of the games finished quickly so we were partially spared from having to endure a marathon. Going into the tournament, John Ludwig was the top seed and the clear favorite, as the second seed was 303 points behind. Amazingly, to me at least, in the first round, all the higher rated players won their games; there were no upsets at all! That meant that the six highest rated players were all on 1/1, and the second half was tied for seventh on 0/1. That obviously meant that Ludwig won his game, Black against Daniel Smith in the longest game of the first round. In the second round, Ludwig won again, this time with White against John Givler. Meanwhile, Ryan Hamley defeated Paul Leggett to maintain his perfect score. On board two, I was Black against William Fink and I played the Queen’s Gambit Declined. I went a pawn up on move twenty-five and declined a draw offer on move twenty-eight. However, despite keeping that material advantage for the remainder of the game I had to acquiesce to a draw on move seventy-one, the last game to finish. Midway through the tournament, Hamley was White against Ludwig, but Hamley could not stop the top seed from maintaining his perfect score. Therefore, after the first day, Ludwig was the sole leader on 3/3, with me on 2.5/3. My White victory over Givler was the last game to finish in round three, and because I was due Black and Ludwig was due White for round four, I knew I would be Black against Ludwig on Sunday morning. Therefore, I did a lot of preparation for that game; so much, in fact, that I was slightly late for my game! However, it paid off as in the Scotch I was still in book ten moves into the game and my eighth move seemed to surprise my opponent, as he spent a lot of time on his reply. However, I was worse, to varying degrees, for most of the game, but I hung in there and eventually, with Ludwig down to less than a minute, we liquidated to bare Kings and split the point. Going into the final round, Ludwig was half a point clear of Hamley and me. Ludwig was Black against Darien Brown whilst I was White against Hamley on board two. Ludwig beat Brown very quickly as Black to retain the CFCC Championship. That left Hamley and me to battle it out, and after weathering Hamley’s Kingside attack, I managed to win in the endgame to secure second outright. Ludwig’s victory took his CFCC Championship count up to five. Congratulations! The club also held its annual meeting to elect CFCC board members as it does at each year's Club Championship tournament. The CFCC members page has been updated to reflect the newly elected 2018 board of directors.